Digital entertainment will continue to evolve in 2017. In the mobile space, online video gaming has changed, with a move away from longer form Role Playing Games (RPG), to shorter games which allow greater interaction with other players. That said, casual games maintain their dominance in this industry. However, there's a significant rise in popularity of titles such as 'Clash Royale' which are competitive, short-form games that also integrate the idea of clans or teams of players. Aided by the adoption of popular franchises onto mobile devices, 2016 has seen strong growth in the number of games accessed on smartphones. Both new, optimized titles -- in terms of engagement and revenue generation -- and reworked classics have proved to be a hit with consumers. A new study from Juniper Research has found that revenues from the global digital games market are set to reach the $100 billion milestone by the end of this year. That's an amazing accomplishment. According to the latest market study findings, contrary to previous concerns, the PC market has seen re-invigoration via Free to Play (F2P) games. Besides, coupled with the continued growth of mobile, the online video game industry will see total revenues reach $132 billion by 2021. Juniper found Supercell to be the clear market leader, effectively monetizing consumers through engaging games, highly rated by consumers. The research advised that publishers such as Niantic must create longevity and engagement, so they don't see a drop-off in terms of active users. Publishers are now seeking to integrate in-game advertising. The research found that this will be most effective when users opt-in -- watching a short video to provide players with additional in-game credits can be marketed alongside paid options for an ad-free experience. 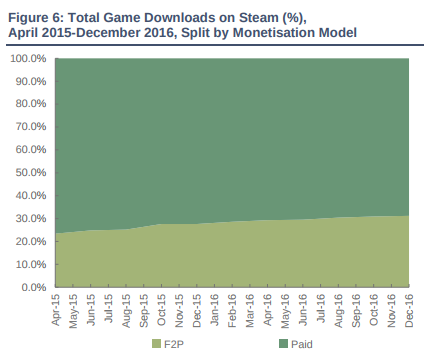 The research noted rapid adoption of the F2P monetization strategy on PC devices, where consumers are enticed into accessing a game which is free, before developers harness the freemium model -- popularized by mobile games, in order to accelerate spend, with this accounting for almost 80 percent of the platform's revenues by 2021. "Juniper analysts believe there is further opportunity for F2P on PC -- particularly in Western markets -- as well as console, with digital platforms such as Xbox Live playing host to F2P titles, which are then monetized via in-game purchases and add-ons," said Lauren Foye, analyst at Juniper Research.